HMH Books for Young Readers, 9780544959002, 48pp. Under the sea, fish do what fish do: Seahorse hides, Pufferfish puffs up, Parrotfish crunches coral, and Crab . . . bakes cakes? Scallop swims, Dolphin blows bubbles, and . . . Crab bakes cakes. And so life goes on, until one night when everything changes with a splash! 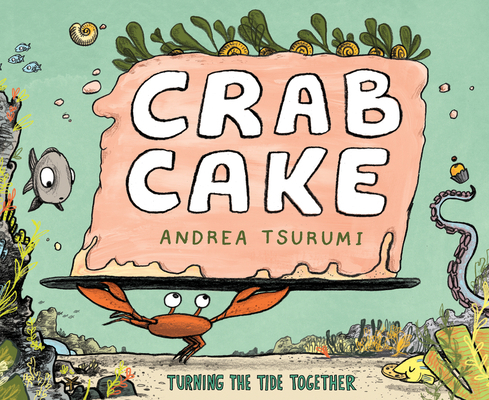 In the face of total disaster, can Crab's small, brave act help the community come together and carry on? Andrea Tsurumi is the author of the acclaimed Accident!. An illustrator and cartoonist born and raised in New York, Andrea has a passion for history, an MFA from the School of Visual Arts, and a Society of Illustrators Silver Medal. She now lives and draws in Philadelphia alongside her husband and their dog, Spatula. Visit her at andreatsurumi.com, on Twitter @AndreaTsurumi, and on Instagram @atsurumi.